Hey everyone, important quick updates before I get into this swatch post. First, my computer's screen is still being flaky. It has decided to work for a bit right now so I took advantage of that by editing as many pictures as I could. Replacing a bunch of parts has done nothing to keep it working and it appears that it must be a glitch caused by static, instead. My husband is trying to find a permanent solution. I'm just going to say that editing my photos on a CRT monitor (or our TV) is not my thing. I've had a stern talk with my computer about it's behavior, so hopefully things will improve soon. Second, and more serious, my pregnant mommy check-ups are now happening twice-weekly. The great news is that I'm basically feeling fine, and the baby seems to be good, too. I'm being monitored closely because of my low amniotic fluid level, which can turn into a serious complication. At any one of these check-ups there is the possibility that I'll be kept at the hospital, probably until our baby is delivered. At this rate it's not looking like I'll reach my Sept 21st due date. Personally I'm doing everything I can to hydrate myself and praying that the level will go up! So basically, if the blog suddenly goes silent, don't worry too much. I'll try to keep updates going on Instagram if I can't post them here, so be sure to follow me there. Now on to the more frivolous and fun stuff. ;D Recently Michelle of the etsy shop Laquerlicious Unity moved some beautiful polishes into the clearance section of her shop, so this prompted a little spree on my behalf! She was generous enough to send along a few minis, two of which are from her new All Things Diva collection, for swatching and sharing on my blog. I'm really excited about the colors she surprised me with, because they are shades that I was curious about! First I tried Divine Doll. The shop description is perfect: "a shimmery grape purple with an aqua shimmer and caramel and teal micro glitter" - yep, that's exactly what it is! 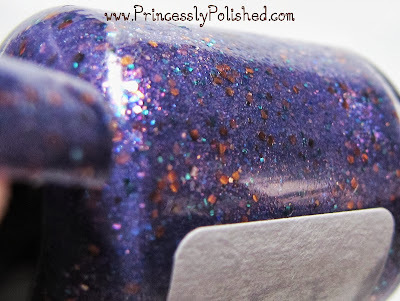 The purple tends to looks a bit like a blurple thanks to the aqua shimmer, and it's loaded with small glitters. I used 2 coats for full coverage. Application was a tad bit finicky but typical of this type of polish. For best results you need to work quickly, applying a thin-ish first coat. It wants to dry fast so if you mess with it too much the heavy shimmer pigment and glitters will start to drag and make bald spots. So give that first coat a moment to dry and set up on your nail. Then the 2nd coat applies perfectly! I took a bottle shot to try to show off the pretty glitters better. Between the color purple and the heavy shimmer my camera was at a bit of a loss while photographing my nails. I love the caramel and teal glitters in this polish! They really pop, and I don't have anything like this shade in my collection. This polish is a color combination that I would have never thought of, but totally works! I was also very happy that it was friendly to my pale skin tone. May I also point out that this super-duper shimmery polish shows not a single brushstroke? Hooray for being frost-free! Being glitter-heavy, it does have texture when dry. Not gritty texture, though. I used 1 coat of Poshe to top this manicure off, and while it wasn't glassy smooth, I didn't notice my nails having texture. Also, removal... actually not bad! I soaked a cotton pad with remover, held it on my nail for a few minutes, and most the glitter wiped right off. I advise against scrubbing at the glitter; then it does turn into a sparkle-splosion on your hands. The only complaint that I could mention about this polish is that it has a stronger smell than the other Laquerlicious shades I've tried. It has the regular polish smell and a little something more. A sort of sweet, chemical-y odor. I'm guessing that these might use a different base to suspend all the shimmer, and that would be the cause for a different smell. (My full-size bottles just smell like typical glitter polish!) The smell disappears when you apply topcoat, so it is only a temporary suffering! Gorgeous! I see so many pretty polishes on her site, too bad she doesn't ship outside the US. Hope you and your baby will be fine! Oh, I should have added this link to the end of my post! Not sure what country you need to get them to, but http://www.beautysofly.com/ is an International stockist for Laquerlicious. Last I heard they were having some website issues but you can also place orders through their Facebook page if that is the case. Hope that helps! If not, maybe contact your "local" International stockist and see if they could get Michelle's polishes added to their store? Thank you for the link! Added it to my favorites.